Each GCJ journey is a multilayered experience in cross-cultural communication, leadership development and community service. Participants discover new ways of thinking and living and learn to see the uniqueness of their own cultural gifts through the eyes of others. Our destinations are on the road less taken. Part of our mission is to shed light on areas and issues that are not well understood in the U.S., enabling voices largely unknown outside their borders to be heard. How Does a GCJ Journey Work? GCJ Journeys are designed to form lasting bonds between delegates and the host country. Each phase of the experience is equally important, from planning for the journey to the spin-off projects that stem from individual delegates’ passion. Roughly 15 U.S. delegates are chosen to travel, live and work for 2.5 to three weeks with the same number of local and regional delegates. Participants represent a diverse mix of religions, ethnicity, gender, ages, socio-economic levels, lifestyles and professions. The planning and leadership roles are shared between the host country organizing the group and the U.S. organizing group, the result is that when the time comes to step onto the plane, delegates are excited to meet their new friends with whom they’ve already developed a rapport. Participants are housed in the host village, sharing meals and getting to know the local families, working daily on a community service project which is identified and organized by the host community. The project might be planting trees, wetland restoration, building homes or a community building, such as the library built in Nigeria in 2005. Delegates also participate in daily workshops and dialogues to promote cross-cultural communication, conflict resolution and compassionate listening skills, leadership development and environmental awareness. 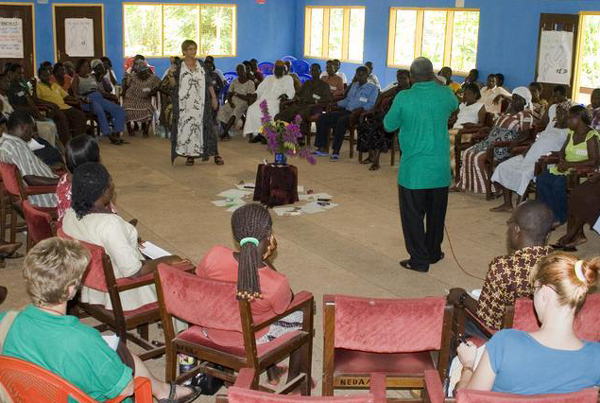 (Read an overview of GCJ circles and workshops). Additional activities to enhance learning and understanding include music, crafts and art, recreation, visits with local dignitaries, side trips to cultural sites, and the sharing of participants’ native music, holidays and favorite foods. We work with the local community to host a Town Hall meeting using World Cafe and Open Space processes, inviting 50 to 150 local residents to join in dialogue about their issues and ways to create a vision for their desired future. Upon their return, many of our delegates stay in contact with the friends they’ve made and keep working on the issues they care about. 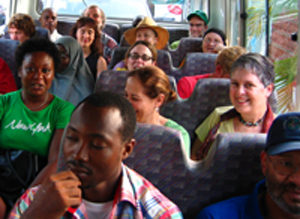 Check out the Ghana and Nigeria pages for an idea of some of the spin-off projects that have resulted from those journeys. It is vital for delegates to extend the journey into our home communities by sharing their experiences and learning before, during and after the journey. Many delegates are sponsored by a group or organization. Participants without organizational sponsors develop individual plans to share their stories in other ways, ensuring that their experiences also reach a wider network. Have an idea for a Journey? Find out what it takes to be a Project Director or an International Host.